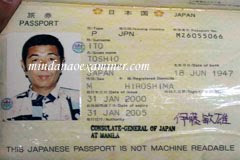 MAGUINDANAO, Philippines (Mindanao Examiner / July 21, 2010) –Philippines authorities are holding a letter sent by a kidnapped Japanese man in the country’s restive southern region where security forces have mounted an operation to rescue the 63-year old Hiroshima native. 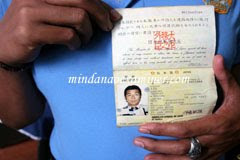 Police said Amer Katayama Mamaito, whose real name is Toshio Ito, was seized by 10 gunmen July 16 on a fishing village on the remote island of Pangutaran in Sulu archipelago. 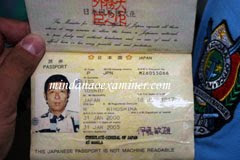 His passport, issued January 31, 2000 at the Japanese embassy in Manila, was recovered on the island, but no group has claimed responsibility for the kidnapping, although authorities were suspecting Abu Sayyaf militants with links to Jemaah Islamiya could be behind it. The Abu Sayyaf last year kidnapped three international Red Cross workers – Two European and a Filipino – in Sulu and had been ransomed off. The group was also behind high-profile kidnapping cases, including 21 mostly Westerners in Malaysia’s Sipadan Island in 2000 and three US citizens in 2001 in Dos Palmas resort in Palawan island in the Philippines. Security sources on Wednesday said a letter written by Ito is now in the custody of the authorities, but its contents were not made public and that the Japanese embassy had been notified about this. Police and military officials did not give any statement about the progress of the rescue operation, saying, it could jeopardize the mission or put the safety of the Japanese at risk. “All we can say is that there is an ongoing search and rescue operation,” said Marine Brigadier General Rustico Guerrero, commander of military forces in Sulu archipelago. Police also put up a task force that will handle the investigation of the kidnapping of Ito under supervision of the crisis committee headed by Mayor Amilhamja Taib, of Pangutaran Island.